The Speedo is a 66-key ergonomic keyboard. 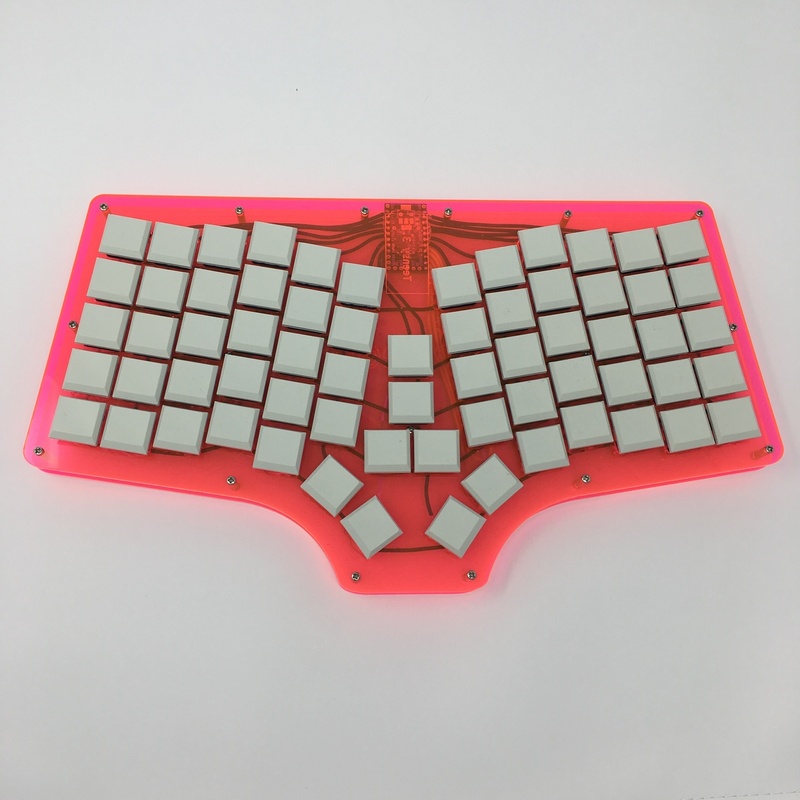 It is heavily inspired by the Atreus and Atreus62 but introduces a few improvements. One of the most common complaints about the Atreus(62) is the location of the inner-most thumb keys. The Speedo takes the two inner-most thumb keys from each side and places them in a curved arc, making them easier to press via a natural thumb movement. Rather than waste the space in the middle of the board, the Speedo adds 4 extra keys in the center which can serve a few different purposes. For some users, having dedicated arrow keys or home, end, page up, and page down can be useful. For others, having programmable macro keys, which is possible with QMK firmware, adds utility. Personally, I like having the extra keys as an area to showcase artisan keycaps. Artisans can add personality to a keyboard but they are generally less comfortable to press so having them on commonly pressed keys is not ideal. The 4 additional keys are symmetrical and centrally located, making them a great place to add some flair to the keyboard. As with all of the CozyKeys projects, the Speedo is and will remain completely open source. This means that the same design files I use to get the parts manufactured will be available on GitHub. The goal behind this is to allow other enthusiasts to fork and modify the designs to their own liking. Pull requests are also happily accepted! Check out the Speedo GitHub repository!